When you live alone, you can hog the bathroom, watch whatever you want on TV, and eat an entire box of pizza in your underwear without judgment. Although the benefits of living alone seem endless, a healthy diet is not one of them. According to a recent study published in the journal Nutrition Reviews, people who live alone are more likely to suffer from poor nutrition due to eating less fruits and vegetables, and more ready-made meals. "Our results found that people who live alone have a lower diversity of food intake and a lower consumption of some core food groups like fruits and vegetables and fish," said Dr. Katherine Hanna, from Queensland University of Technology School - Exercise and Nutrition Sciences, in the press release. Previous research has found living alone has implications for nutrition and health outcomes. In a 2013 study, researchers looked at the association between mortality (overall risk of death) and a pair of conditions, including social isolation (a lack of contact with others), and loneliness (reflected by participants’ answers on a survey) in the elderly. The findings revealed limited contact did increase a person’s overall risk of death over time because they were less likely to get help in managing various ailments, and less likely to be encouraged to go see a doctor when health problems would arise. Now, in an effort to explore whether living alone may even cause people to have poorer health habits, Hanna and Dr. Peter Collins used eight electronic databases to search terms related to living alone, nutrition, food, and socioeconomic factors. Forty-one previous studies were analyzed to see whether there was a difference in food and nutrient intake between people living alone and those living with others. The findings revealed, compared with those who do not live alone, people who lived alone had a poor diet, specifically men. This is explained by inadequate cooking skills, no partner to go shopping with, increased cost of food, and a lack of motivation to cook, that led single people to indulge in “simple or ready-made meals lacking key nutrients.” Other factors that affected the eating habits of singles, included age, socioeconomic factors, and emotions resulting from being divorced or widowed. 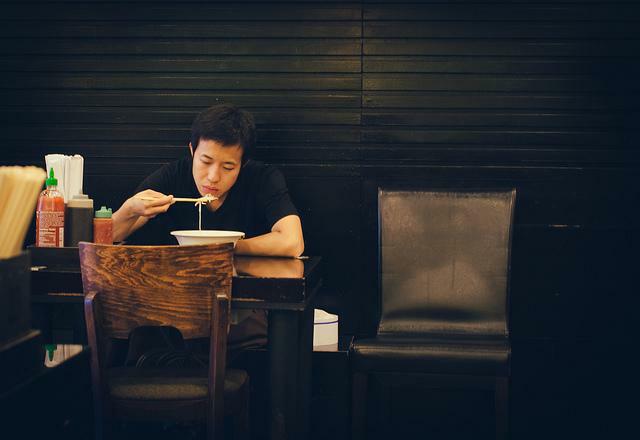 This suggests living alone could negatively affect some aspects of food intake and contribute to the relationship between living alone and poor health outcomes. The researchers do warrant further research to help clarify these findings. This study adds support to the argument that loneliness, for example, can be a significant predictor of poor nutrition — even in the elderly. In a 2011 study, researchers analyzed the differences in nutritional status of elderly people living alone compared to those who lived in family surroundings. People who lived alone were at an increased risk of malnutrition, had reduced the number of daily meals, significantly lower their daily intake of protein, fruits and vegetables in the diet, in relation to those who lived in family surroundings. So, what can you do to motivate yourself to eat healthier? Hanna suggests several strategies that include, "programs that focus on cooking skills for single people on a range of budgets, improved availability of affordable healthy food and developing socially acceptable opportunities for eating in communal settings." Also, you can go out there, get social, and find a roommate — for your health’s sake. Sources: Hanna KL and Collins PF. Relationship between living alone and food and nutrient intake. Nutrition Reviews. 2015. Steptoe A, Shankar A, Demakakos P et al. Social isolation, loneliness, and all-cause mortality in older men and women. PNAS. 2013. Ramic E, Pranjic N, Batic-Mujanovic O et al. The effect of loneliness on malnutrition in elderly population. Med Arh. 2011.